Water Features | Cary Landscape Inc.
Water features are wonderful elements to add to just about any landscaping design. Water features can include a variety of fountains, pools, ponds, cascades, waterfalls and streams. Any can be the center piece to your landscape or compliment any theme. 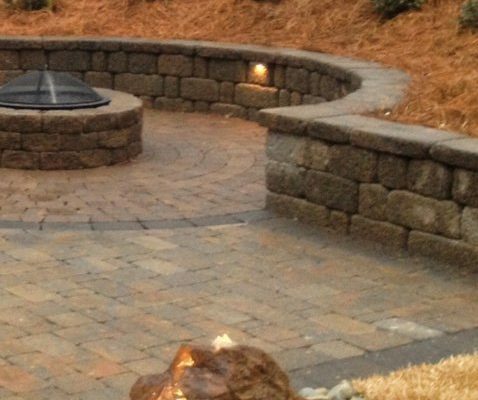 Depending on your budget we can do anything from huge waterfalls to a simply designed feature that offers the soothing and relaxing sound of water. Landscape ponds are a particularly great addition to any landscape design. Cary Landscape has all the information you need to create a beautifully designed pond landscape. A properly designed landscape water garden can bring an element of serenity to your surroundings that isn’t easily matched with any other type of landscaping feature. A landscaping water garden is pleasing to the eye, welcoming to birds, and the enchanting sounds associated with falling water create an atmosphere of relaxation and tranquility.